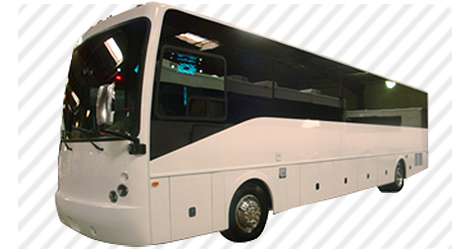 Don’t miss out on ULC’s exclusive and top of the line 52 passenger party bus. Prom season here we come! This beast is a beauty for all prom goers, homecoming dances, or just one heck of a fun night out on the town. So you’ve got you and your closest 51 friends, its Friday night, and you have no clue what you’re going to do to pass the time. How are all of you supposed to meet up at the same place without having to wait 2 hours for everyone to finally show up? How do you keep everyone from getting lost or separated, or heading out to the club, restaurant, or event in the wrong city? Your answer is simple – take a party bus! Perfect for weddings, quinceaneras, bachelor and bachelorettes parties, clubbing events, and just plain old night on the town events! And with a bus as well equipped as this, you’ll forget all of your worries and cares as you said away in style, luxury, and happiness. Try out our fully equipped stereo system with radio tuner, CD player, auxiliary capabilities, and DVD player with flat screen TVs to view your favorite movies and music videos on! And so long as you’ve got your designated DJ on board, then that gives you all the time in the world to make use of the gorgeous dance floor laid out beneath your feet and shake what your momma gave you! If you thought driving in a limousine was the height of luxury, then you haven’t seen anything until you’ve seen a fully lit up party bus, shining the fiber optics and lasers like the ceiling is your own personal light show. Not only will you be cruising around town in style, but you’ll feel safer than a kitten in a basket with our fully inspected and insured vehicles. Next time you’re thinking about how to get you and your whole group from point A to point B in a timely and extravagant manner, give us a call! Thanks you so much for the excellent service and your driver was awesome to say the least.She was perfect my and my daughter’s Mother’s needs in both understanding as mother as herself and her professional attitude too was great.I have been in many limos over the past 30 years and I never been so satisfied with the driver and overall service.I know now who to call or who to direct someone to when a limo is needed.